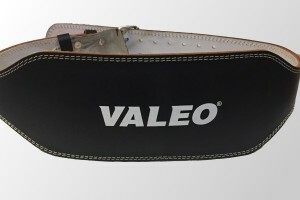 The Valeo lifting belt is a popular choice among many people. It is constructed from 6mm thick leather with double stitched edging. The buckle is double pronged and two loops are also attached to keep the belt tab in place during wear. It is also available in 4 inch and 6 inch width versions. While the quality of the leather is not as good as some more expensive belts, it seems to be made from good quality material for the price. It looks to be made up from layers of leather meaning that it is quite stiff at first so during the first few uses it can take a little extra effort to wear in. However, it is strong and can easily take a lot of pressure. The layer of suede on the inside provides some comfort and helps to prevent slipping. This goes well with padding in the back which is comfortable but helps to provide compression against the mid-section of the wearers body. This makes it brilliant for building up intra-abdominal pressure as this padding fills the crevices in the wearers back. This belt is available in many different sizes from small at 24 to 30 inches, through medium, large and all of the way up to extra large extending to 51 inches. The sizes are in ranges of 6 inches each can make it difficult for a first time belt buyer not knowing which size to order. Many people make the mistake of using their waist size for their jeans when ordering a belt like this. This is wrong as clothing sizes often differ to belt sizes and sometimes don’t even reflect the actual size of the waist. The sure fire way is to actually measure yourself with a tape measure and order the size that matches that. After ordering the correct size, this belt fits nice and snug with a lot of extra notches available for any weight gain or loss in the future. For squats, this belt was very firm and supportive. The cushioning goes right up to the edge of the back which some other belts lack. This means that the edges are nice and rounded and do not dig into the body mid squat. The padding is also very thick at around double the amount of an average belt. This will make it very appealing to beginners who are not used to the tough leather of some of the more professional belts. After a little time wearing it in, we found it to be good for deadlifts also. The leather gave just the right amount of flexibility to allow the correct motion. The cushioning, level of comfort and price makes it a nice belt for both male and female beginner and intermediate lifters. Ladies should check out our womens weightlifting belt guide for more suitable belts. It is supportive, firm and will take some abuse from the average gym-goer. But if you are a professional powerlifter looking for something to withstand your 400lb squat then you should probably seek out something tougher.